A City Inscribed event. Registration is required. How has the literature and cinema of Hong Kong responded to major transformations? In particular, how have the upheavals associated with the 1967 riots and the 1997 handover been marked by the literary and the visual? 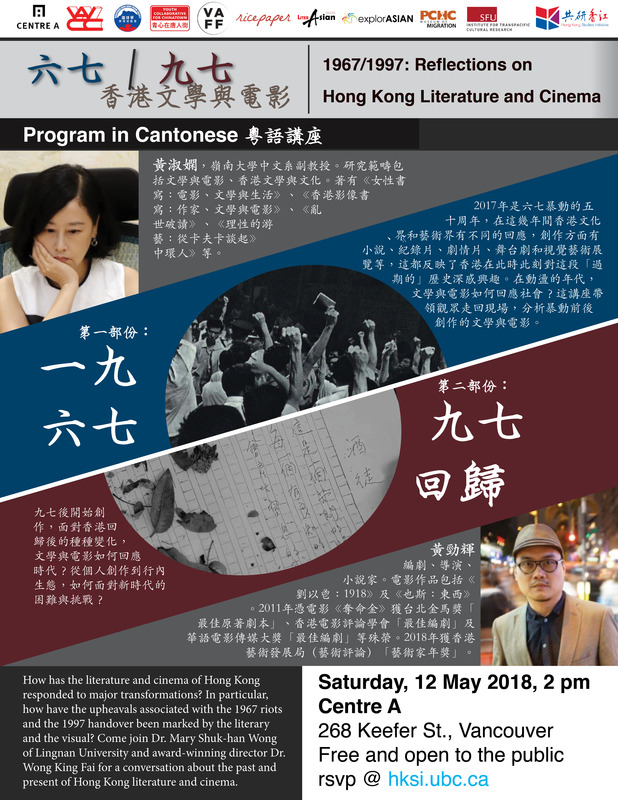 Come join Dr. Mary Shuk-Han Wong of Lingnan University and award-winning director Dr. Wong King Fai for a conversation about the past and present of Hong Kong literature and cinema. Dr. Mary Shuk-Han WONG is an associate professor in the Department of Chinese at Lingnan University, Hong Kong. She has published widely on film and literature. She is the author of Feminine Writing: Cinema, Literature and Everyday Live (2014) and Hong Kong Cinema: Writer, Literature and Cinema (2013). Major edited works include the “Hong Kong Literature and Culture of the 1950s” series (2013) and the “Hong Kong Literature and Culture of the 1960s” series (2018). She is also a novelist and essayist. Major creative works include Against the Grain (2017), From Kafka (2015), and an award-winning collection of short stories, Surviving Central (2013). She is also the co-producer of the documentaries 1918 (2015) and Boundary (2015). An edited anthology, Hong Kong 1960s, is scheduled to appear in June 2018. Dr. WONG King Fai is an award-winning film director, screenwriter, and novelist. He is the director of 1918 and Boundary, which document, respectively, the literary lives of Liu Yichang (1918–) and Ye Si (1949–2013), two of the most-celebrated writers of Hong Kong. Dr. Wong’s screenplay for the film Life without Principle (2011) has garnered a number of prestigious awards, including the Best Original Screenplay (the Taipei Golden Horse Film Festival and Awards), the Best Screenwriter (Hong Kong Film Critics Society Awards), and the Best Screenwriter (Chinese Film Media Awards). Dr. Wong has published two collections of short stories and is Chief Editor of the series “Literature and Cinema” (Hong Kong University Press). Dr. Wong has been named the 2018 Best Artist (Arts Criticism) by the Hong Kong Arts Development Council. This community talk is organized by UBC Hong Kong Studies Initiative and co-sponsored by Centre A, Chinese Canadian Writers’ Association, Vancouver Hong Kong Forum Society, Youth Collaborative for Chinatown, Vancouver Asian Film Festival, Ricepaper Magazine, LiterASIAN Festival, explorASIAN/VAHMS, PCHC–MoM Society, and Institute for Transpacific Cultural Research (SFU). Online registration is now closed. To find out if it is still possible to attend, please email us @ hksi.ubc@ubc.ca.